Installers have told us that it takes their crews 30% less time to install an Enphase IQ Microinverter System over other types of systems – and it’s even faster than earlier generations of Enphase systems. One of the key reasons for these results is the revolutionary design of the Q Cable. It’s a true time saver in many ways, and its lightweight design reduces the physical toll on your crew day after day. Many of the components in the new IQ system are lighter than previous generations. The Q Cable is 50% lighter than our Engage cable. That may not seem like much. However, when you are installing on a sloped roof, the lighter the product, the easier it is to manage and work with. If you have a 15-panel system, even shaving a couple of pounds off system components can mean less strain carrying everything up and down the ladder. While we’re on the topic of less is more, we’ve improved our packaging so there’s less waste and excess wiring left over after each job. The Q Cable is packaged in a box, not a roll like previous generations, and very importantly, the box includes extra connections. That means no more waste! Just connect the end of one box to the first Q Connector in the next box. There are even two extra connectors in every box. This plug and play functionality is made possible because the Q Connectors are rated at a full 20 Amp capacity of the circuit. This also enables more flexibility when it comes to design, as we’ll highlight below. One of the biggest changes with the IQ system over previous Enphase generations is how the system is wired. There used to be four conductors for each microinverter. Line 1 & 2, a neutral and a ground. The casing of the IQ Microinverters is an engineered polymer. That helps the microinverter reach its double insulated status. As a result, we no longer need an EGC, so we were able to remove the ground conductor from our cabling. Our engineers also thought another benefit for installers would be to remove the neutral wire. 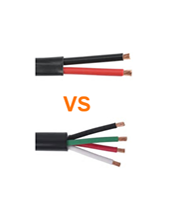 One of the more important differences between the IQ and our previous microinverters is the lack of a neutral wire. The neutral was utilized as part of the communications between the microinverters and the Envoy. Since the new models use improved communications protocol to interact with the Envoy, that means IQ microinverters and the IQ Envoy are not currently backwards compatible with our previous generations of product, at least not at this time. Now with just two wires, that’s less copper, which makes for a 50% lighter cable, a less expensive component overall. Combined with less time connecting wires for the install and better packaging, these benefits all add up to save your install teams time, which is money. And then you save even more money with a lower balance of system costs. The Q Cable and the Q Field-Wireable Connector accessory make the Enphase IQ system truly plug-and-play while adding new levels of simplicity that result in greater flexibility for installs. For instance, the Q Cable makes it easy to switch from portrait to landscape, or from portrait to raw, when you need to span a distance to a different facet of the roof. The benefits of the Q Cable and Q Field-Wireable Connectors go even deeper than that. Enphase IQ Microinverters are wired line to line. As we noted earlier, every connector is rated for the full ampacity of the circuit. That means that any open connector can become a place that you can branch off of to extend the system. In the example above you can see that we actually branched off of the main line to go to another sub array on a different section of the roof. Q Field-Wireable Connectors were used to connect to our Q Aggregator. This means complex roofs are no longer a problem! The flexibility of the IQ System makes design and install much easier. Watch this video to learn more about designing with and using our new Q Field-Wireable Connectors.